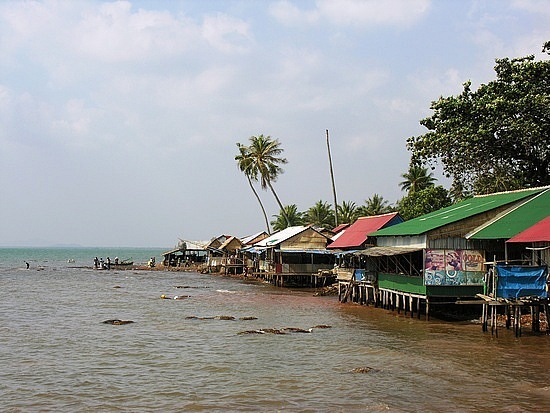 Dining in Kep is all about fresh seafood. For the best deals head to the Crab Market, a row of wooden waterfront shacks where you can tuck into mouth-watering grilled prawns, crab, squid, squid and fish. In case you're interested, crabs - kept alive in pens tethered a few metres off the pebbly beach - cost per kilo. There's a lovely local feeling to the whole place. Popular with the Cambodian tourists long before westerners discovered it. "The crab came fat and meaty just as she had promised, cracked and covered with stalks of fresh green Kampot pepper corns. The big plate was truly BIG. More crab than I could eat, almost. And they were delicious. Fresh and sweet. And the small sour soup turned out to be a large flaming tureen of at least 15 good size shrimp, plenty of soup for two. Along with a couple/few big bottles of tepid Angkor beer on ice, it was all quite the feast". "As I ate, I watched the storm out over the ocean, murky monsoon skies and great gray sheets of rain sweeping across the water. Just out the window, hard-faced women hauled crab traps in and out of the surf. The wind blew and waves lapped and the whole place creaked under the strain. Hot sparks scattered from the flaming tureen across the table and wisps of rain blew through the restaurant. I lined Angkor beer bottles into a wall against the wind, protecting the tureen. A dog (presumably the family dog) laid under my chair waiting for scraps, occasionally whimpering short reminders of his patient presence. I finished dinner and had a smoke and another beer. The waitress lit and relit my fag and never let my glass run dry (or short of ice.) Nice Cambodian place". If you�re not tempted by the local specialities, or just fancy a change, then the French run La Baraka offers Western choices as well as Khmer dishes and their huge and inexpensive pizzas are particularly good. Restaurant after restaurant, including an Italian eatery, line the curved seafront. From 4 a.m., local women, colourfully wrapped from head to toe, stand knee-deep in the surf and negotiate prices for the live crabs that are packed into wicker baskets bobbing in the shallow water. A little offshore, bright green long-tail fishing boats are anchored against the backdrop of the Vietnamese island of Phu Qoc and, to the west, Bokor Mountain. 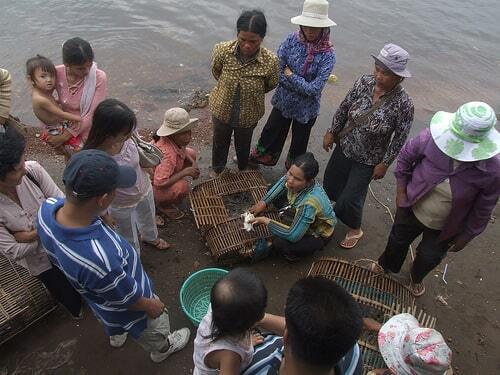 Delicious steamed crab, for which Kep is known all over the country, is served all day. From the restaurants you can observe the fishermen bringing back fresh crab, which will be immediately sold from the vendors at the beach. Talking of breezy another excellent spot we recommend is the aptly named Breezes Restaurant � again facing the sea but further down the coast heading towards the boat pier for Rabbit Island. The charming host, Korean/Dutch Jerome also offers seafood but specializes in more unusual Khmer/European fusion dishes. (His Kampot wild oysters are sublime!) Tasteful decor and jazz make Breezes seem pretty classy but prices are very reasonable! Jerome will also conveniently organize transport to and/or from your accommodation for you.